Image of the barge Argo on the bottom of Lake Erie off Erie County. KELLEYS ISLAND — A tanker barge listed by federal officials as potentially the most hazardous shipwreck in the Great Lakes has probably been found in Lake Erie 78 years after it sank — and it appears to be slowly leaking some of its cargo. 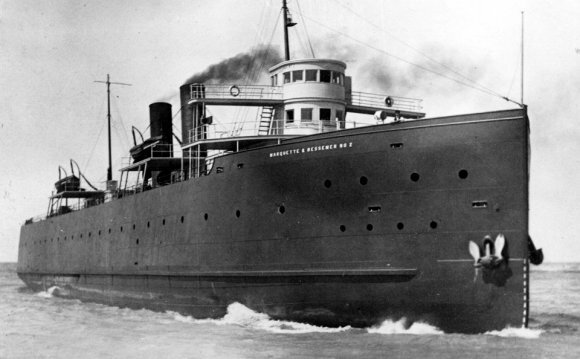 The Coast Guard and the National Museum of the Great Lakes will announce during a news conference today that a Lakeside, Ohio-based shipwreck hunter on Aug. 28 found a barge matching the description of the Argo, which was lost during a storm in October 1937 in about 50 feet of water about eight miles east of Kelleys Island. But it was only on Friday, during a dive to confirm the sunken vessel’s dimensions after a Coast Guard contractor’s divers earlier last week raised doubts about its identity, that Tom Kowalczk, director of research and remote sensing for the Cleveland Underwater Explorers, noticed the intermittent appearance of small oily droplets on the water’s surface directly above the wreck. During the news conference today, Commander Migliorini said a 1, 000-foot radius around the site has been declared “a regulatory safety zone” into which mariners are not to enter. The coordinates for the zone are being broadcast on marine radio. “We highly recommend to boaters that they stay as far out of that area as possible, ” the commander said. The Argo is believed to have been carrying about 100, 000 gallons each of crude light oil and benzol, a tar-like material containing benzene and toluene, when the barge became distressed during the storm and was abandoned by the tug towing it. Early this decade, the National Oceanographic and Atmospheric Administration listed it among 89 shipwrecks believed to pose a significant environmental threat to United States waters because of their cargoes or fueling systems. Five of those vessels were lost in the Great Lakes, and of them the Argo was deemed potentially most dangerous because of the size and unknown status of its cargo. Also complicating matters was that its location was unknown. The NOAA assessment of the Argo, prepared in 2013, said its most likely position was in Canadian waters southeast of Pelee Island, but close enough to American waters that any discharge posed a hazard on both sides of that maritime border. Mr. Kowalczk said he found what appeared to be the Argo while looking for something else: a shipwreck from the 1840s that was believed to have gone down in the area off Kelleys Island. 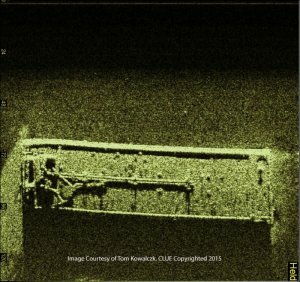 Using side-scan sonar, a technology that allows the lake bed to be surveyed for about 200 yards in either direction from a surface vessel, Mr. Kowalczk was looking for the 19th-century wreck when his system returned an image of the barge. The shipwreck hunter said that once he took closer scans of it, it was pretty clear to him what he had found, because the Argo is the only tanker barge known to have sunk in Lake Erie and not been found. The discovery was cast in some doubt Wednesday when a Coast Guard dive contractor measured the wreck and came up with dimensions significantly smaller than the Argo’s registered size. But that prompted Mr. Kowalczk to commission his own dive on Friday, and he said the results from that measurement matched, within about a foot for both length and width, the Argo’s records. The leaking material, Mr. Kowalczk said, only became obvious because his vessel stayed on station above the wreck for an extended time. “Every once in a while, and randomly, we’d get a whiff of something, ” he said. Before long, his boat’s crew observed tiny bubbles of oil appearing on the surface, then rapidly dissipating. “Ten to 15 seconds, and it was gone, ” Mr. Kowalczk said, adding that there had been occasional reports over the years of boaters smelling a similar odor in that area, but nothing was ever documented or confirmed. The Coast Guard plans to send contractors out to the wreck site on Monday and also has summoned pollution-control experts to the area to assess the situation, Commander Migliorini said. Christopher Gillcrist, executive director of the National Museum of the Great Lakes, said the Argo’s discovery is “a powerful example” of successful collaboration between the not-for-profit sector and government as well as the latter’s ability to respond rapidly to the potential threat. The museum has been providing grant funding to the Cleveland Underwater Explorers to reimburse some of that group’s operating expenses as it looks for Lake Erie shipwrecks, and plans to publish an account of the Argo’s discovery in its journal, Inland Seas.